This is the simplest process for the production of tablets. It consists of three main steps: powder blending, lubrication, and compression. Atomized lipid excipients are used as lubricants or modified-release agents in direct compression. 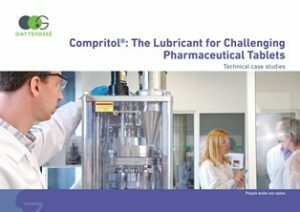 We can provide technical guidelines on the use of Compritol® 888 ATO as lubricant for challenging pharmaceutical tablets that offer useful tips and numerous case studies. Sticking during tableting is a relatively common problem. It is often attributable to tooling and machine setup. However, the formulation, active ingredient, and excipients can play an important role. 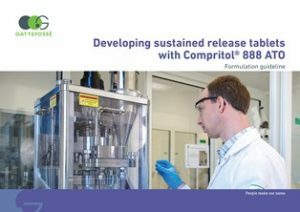 We conducted an in-house study to evaluate the cause of punch adhesion or “sticking,” which occasionally occurs during the compression of powder formulations containing Compritol® 888 ATO. Our study concludes that sticking is primarily due to a combination of factors, including formulation with a “sticky” API and use of ingredients with reduced interparticle bonding capacity. Contact Gattefossé for the full study report.